Last week I eagerly watched the seven group winners at Westminster. Which one would emerge as Best in Show, the most coveted award in the dog show world? All were gorgeous, and I wondered how any judge could pick a victor among such a stellar bunch. Eventually the lovely Miss P, a 15-inch beagle, trotted away with the top prize. The purpose of conformation classes at an AKC (American Kennel Club) dog show is to evaluate a dog’s structure and compare it against a written description of the perfect specimen of its breed, known as the “standard.” Although it appears as if the dogs are competing against each other, they’re really competing against the specifications of their breed standard. The ultimate goal is to improve breeding stock. But there’s more to a great dog than just looks and structure. Are AKC dog conformation shows important tools to improve dog breeds, or are they merely worthless doggie beauty pageants? Dog shows, and the breeding practices associated with them, have come under attack for a multitude of reasons for many years. Inbreeding, in particular, has been criticized. This is the practice of mating closely related dogs in order to pass along desirable attributes to the next generation. For example, a breeder might have a dog with very favorable characteristics. That dog is bred to his daughter in order to preserve his “breed type” in the breeder’s stock. It may ensure great-looking pups that win at shows, but it can also pass along bad genes and weaken future generations. Inbreeding in the dog show world is widespread; one study of 20,000 boxers had the genetic variance of a population of 70! Veterinarians condemn some of the breed standards that have evolved over the years. 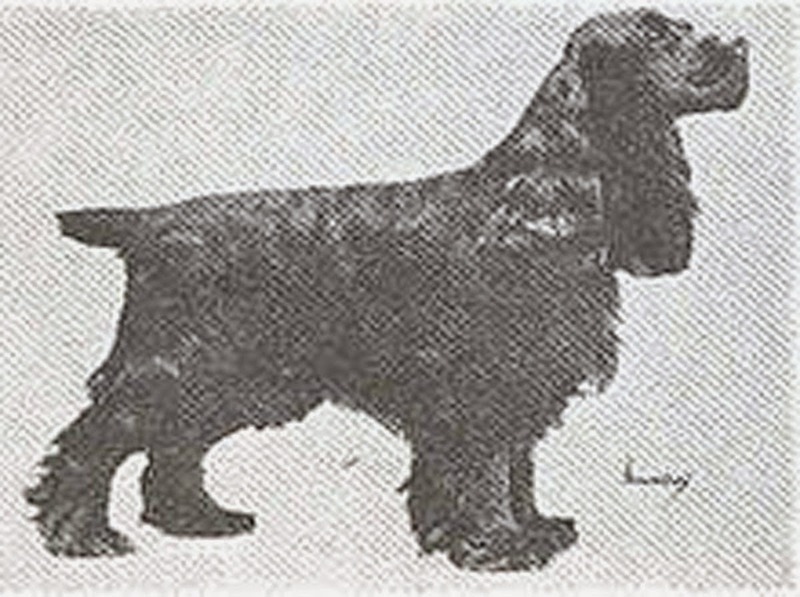 Because I am particularly fond of spaniels, I’ll use the evolution of the American cocker spaniel as an illustration. My Own Brucie was Best in Show at Westminster in 1940 and 1941. This early photo shows a solid dog with a beautiful topline and great conformation. The cocker is a sporting breed, and My Own Brucie has the short, silky coat that is easily cleared of dirt and burrs after a day of hunting. His muzzle is long, which ensures an unobstructed airway, important for endurance. 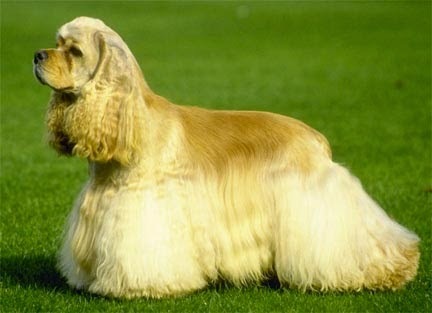 Here’s an example of a modern American Cocker Spaniel. He may be adorable, but with his shortened muzzle and luxurious coat, he’s not a good choice for hunting in heavy underbrush on a warm day. The modern German shepherd dog is perhaps the best-known example of a breed whose functionality has been compromised: Bred so that his hind end is sharply angulated toward the ground, he’s reduced to moving with an unsightly, slinky gait. Breeders erroneously think that gives their dogs better forward propulsion. Another criticism of shows is that the health of the dogs is not taken into consideration unless an obvious defect is noted. After all, a judge cannot see that the dog they just named a group winner has epilepsy and a gene for juvenile diabetes. Temperament is another trait that is difficult to evaluate in a show ring. Those are valid criticisms of AKC conformation classes, but I’ve seen a different side of dog shows. 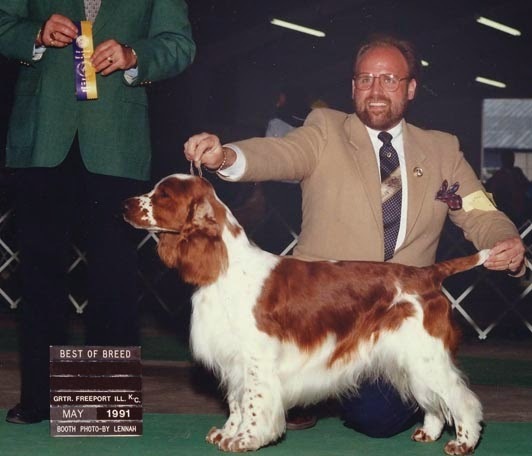 I was the proud owner of a winning show dog, a Welsh springer spaniel named Chris. Sure, I knew of breeders who didn’t care about anything but winning and would lie about their dog’s health; but I also saw breeders who would relentlessly neuter all but their best hunters that were also healthy and had good conformation. It’s easy to criticize breeders whose dogs pass along genetic problems, but until we have genetic testing for more conditions, it’s impossible to predict some of the maladies that may befall a foundation sire after he already has litters on the ground. But whether it’s the AKC or the UKC, there will always be breeders with dubious morals who want to win at any cost. They won’t care if the means to that end is injecting their dog with steroids so they win the weight-pulling contest. Folks of that ilk won’t care that all the pugs they breed will need surgery on their nostrils so they can breathe properly. There’s no doubt that many breed clubs should overhaul their breed standards to improve functionality and health, and it would be great if the AKC would move more in that direction. But breeders themselves hold the key to minimizing the problems of their own breed, and indeed certain breed clubs are doing their best to do just that. So among the bad apples in the show ring are representatives of excellent breeding programs, and they’re the reason I can’t issue a blanket disapproval of AKC dog shows. 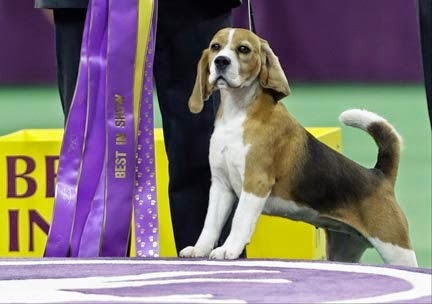 As a vet and former owner of a show dog, I do view the pooch pageants through somewhat of a jaundiced eye, but I still get excited to see a beautiful beagle like Miss P prancing around the show ring! When Cody started licking at a small lesion on his paw, the owner’s grandchildren knew that licking a wound delays healing, so they covered the area with a plastic bag. The puzzled owner of the Sheltie was now in our exam room, concerned because she had just noticed some sticky matted fur just above Cody’s ankle. After thoroughly clipping and cleaning the wound, I found that it was at least ½-inch deep and extended around almost the entire circumference of Cody’s leg. It was typical of a wound caused by a rubber band, and indeed the owner realized that her grandchildren had used a hair elastic to secure the plastic bag. Because the linear cut was so deep and contained dead tissue and pus, I chose to use a wound management technique that has been around since the 1600s: sugar. There’s science behind the use of granulated sugar for this purpose, and it’s based on water. Sugar absorbs moisture, and bacteria don’t like that; they require water to thrive. So sugar in a wound inhibits bacterial growth. 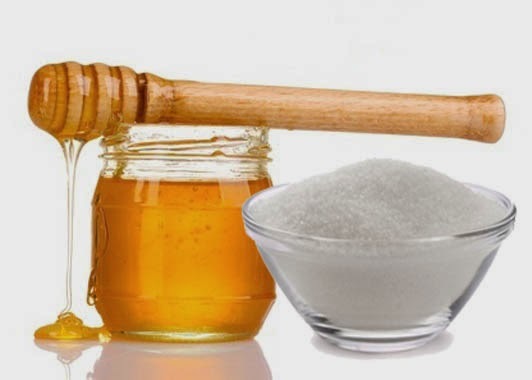 Sugar also decreases tissue inflammation, attracts disease-fighting white blood cells, helps slough devitalized tissue while nourishing the healthy tissue, and forms a protective layer of protein on the wound that promotes healing. None of the antibacterial ointments we use on wounds can claim all those benefits, nor are they as inexpensive as sugar. After the lesion is thoroughly cleaned, copious amounts of sugar are poured on the wound, which is then wrapped with a sterile absorbent dressing. As the sugar draws moisture from the tissue, it eventually becomes diluted and less effective. A bandage change must be done whenever strike-through has occurred, which is when moisture seeps to the outer layer of the dressing. That might necessitate changing the bandage at least twice a day. Because of that, and because sugar bandages are messy to apply, many veterinarians prefer another sweet treatment: honey. Unpasteurized honey has been a staple in wound cleansing and healing in humans for 4,000 years. The active enzymes in honey contribute to its effectiveness but are destroyed by heating, so raw honey does best. In addition to working like sugar, honey contains an antibacterial factor called inhibine, which is actually hydrogen peroxide (H2O2). You might have heard that hydrogen peroxide can damage healthy tissue cells; that’s true, but the level of H2O2 produced by honey in one hour is 1,000 times less concentrated than the 3% stuff you have in your medicine cabinet. That tiny amount of peroxide is antibacterial and is continuously generated by the honey. It also stimulates the growth of blood vessels and healing tissue. Best of all, there is no reported microbial resistance to honey; even multi-drug-resistant bugs succumb. One way to apply honey is to soak an absorbent dressing with it after cleaning the wound. Medical-grade honey, which is free of contaminants such as pesticides, is best. Commercial honey dressings also are available. Honey dressings wick away moisture and adhere to the wound, which makes them excellent for debriding dead tissue from that area. The bandages are changed once or twice a day, depending on how much strike-through occurs. Both honey and sugar bandages are used for a couple of days to a couple of weeks. The end point is when a healthy pink bed of new tissue has formed. My client’s Sheltie did really well with his sugar dressing: By the next day, the wound was clean and the tissue a nice rosy color. Antibiotics are an important part of our armamentarium when we fight infection. But it’s pretty cool that I could use something simple on Cody’s wound that was even better than antibiotics and – more important – didn’t contribute to the creation of the antibiotic resistance that is ubiquitous today. Confusing, right? But I really do understand that thinking, however illogical it might seem. The underlying assumption is that if dogs have food available to them at all times, they won’t overeat but will consume only the amount they need. When the food bowl is kept full all the time, we call it free-feeding. Ad lib feeding, when the dog is fed at his or her request without restriction, is essentially the same thing. It’s probably every pet owner’s dream that they’d be able to dump a large quantity of dry food in their dog’s bowl and their pet would eat only when she’s hungry, and stay thin to boot. The reality is different. My non-scientific guestimate after practicing many years is that 90% of dogs fed that way are fat. For the 10% that stay thin, free-feeding is a wonderful convenience. But what happens when you get another dog? When there’s more than one pet, free-feeding becomes problematic; usually the second dog is in the other 90% and begins to gain weight. Another common scenario is that a previously lean free-fed dog starts to pack on pounds due to the decreased activity and slower metabolism of advancing age. If you free-feed, maybe now’s the time to pick up the food bowl and change your dog’s grazing habit. Converting the free-fed dog to a twice-daily (or thrice-daily, if you prefer) feeding schedule usually isn’t difficult. The first step is measuring the amount of food she actually eats – not how much you feed her – over 24 hours. Do that for a few days. Then take the average amount and divide it into four meals spread evenly throughout the day and evening. Gradually (over several weeks) decrease the amount of one or both of the middle meals to nothing and add that food back to the morning and evening meals. You’re not changing the total amount of food; you’re redistributing it. For the chubby dog, determine the daily average amount of food and decrease it by 20%. Divide that amount into four meals, proceeding as above. Over time, you’ll need to adjust the amount of food to attain your dog’s ideal weight. An overweight dog who isn’t losing 2% to 3% of her body weight monthly is being fed too much. Decrease the amount of food by 10% each month until you reach that goal. When you can easily feel her ribs, increase the amount of food slightly to maintain a lean body weight. Body condition scoring can help you visualize what’s right for your dog. In our practice we use a body condition score range of 1-5 to score every patient, with 3 being the optimal weight. In the aforementioned method, you measure 24-hour food intake to determine your starting point. If you’re technically oriented, you can also estimate the dog’s energy maintenance requirements in calories based on mathematical equations (described below). Once you know how many calories she needs per day, divide that by the number of calories per cup of food. For example, if your dog needs 600 calories per day, and her food contains 300 calories per cup, she gets 2 cups total a day divided into 4 meals. If she’s overweight, you then feed 80% of that number of calories and proceed as above, adjusting the number of calories fed to maintain a reasonable monthly weight loss. Here’s the rub: Very few bags of dog food list the kilocalories/cup of food on their label. However, most dog food companies print an 800 phone number on the bag that you can call to obtain that information. You might also find your brand’s information on the Internet. 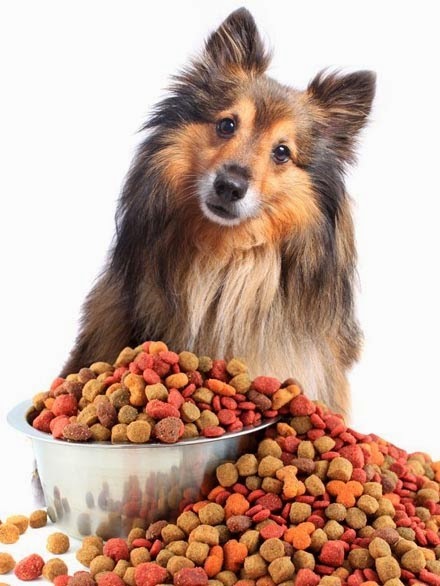 So if the canine cuisine in your house is a 24-hour buffet and your previously lean pooch is getting a paunch, or if you’re adding a new pup to the mix, it’s time to rethink your dog’s feeding regimen. You might have to ignore whining or barking demands for food. Just remember that with a gradual reduction of the number of meals, what you’re seeing isn’t hunger, but a learned response: Yes, you created this monster! But playing with her, taking her for more walks, and giving her safe objects to chew will help distract her. Pull out your smartphone, open the calculator, and turn it so it’s horizontal. Press the xy button (second row down and to the left of the middle). Multiply this result by 70. This is your dog’s resting energy requirement in calories. For weight loss, multiply this number by 0.80, which gives you the energy requirements for weight loss. Now divide this number by the number of calories in a cup (or can) of his or her food to give you the amount in cups (or cans) to feed per day. Feeding her any treats? You must subtract that number from her total calories. In the sample above, let’s say your dog is getting 100 calories of biscuits/day. 668 – 100 = 558 calories of dog food/day allowed, plus the biscuits.